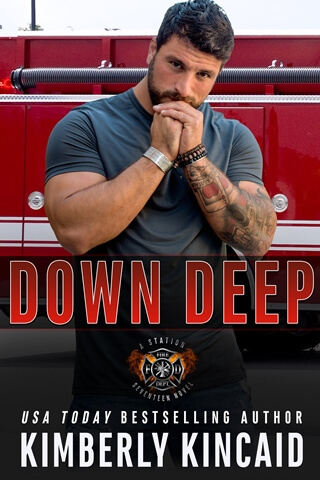 I’m a sucker for well-written suspense, the kind that keeps you turning the pages while afraid of what those pages will hold, and that is the best thing about DEEP DOWN. Ms. Kincaid wrote a villain who really is the stuff of nightmares and knowing that he would get his is poor comfort when the scope of terror he could unleash before getting his comeuppance is so limitless. The fast pace of the action and the tense suspense make every minute of reading this book so worth it! The synopsis of the book is detailed enough to give a reader a very good idea of what to expect in the romance department, so I’m just going to stick with my impressions of Ian and Kennedy. Unfortunately, I was not a huge fan of these two characters. Ian takes ‘stiff upper lip’ to a whole other level that was not very attractive to me and Kennedy’s prickly exterior had the same effect on me. Both of them were too closed off from everyone and it made the speed and potential longevity of their romantic involvement unconvincing, beyond the flash of lust/passion. Kennedy’s determination to go it all alone by herself and her protectiveness of her brother, while sort of admirable, was also foolish and could have had worse results than it did, so not in my pro column. Kennedy’s brother was actually my favorite character (hard not to root for the underdog) and I liked that he choose to be grown up and take responsibility, but I was unable to connect with the main characters and the abrupt ending of the story also threw a damper on my final rating. I hope there is another installment where we can catch up with and get the ending we need. The Grand Prize for 1 winner consists of: ~A 30-minute Google Hangout for the winner and ONE friend with Kimberly Kincaid and BT Urruela!